Storing Peonies in the Fridge – An Experiment — Sweetchic Events, Inc.
* Disclaimer * I am not a florist and I am NOT recommending that you bypass a florist and refrigerate peonies months in advance for your wedding, I am merely testing out something I saw on TV and passing along the info! 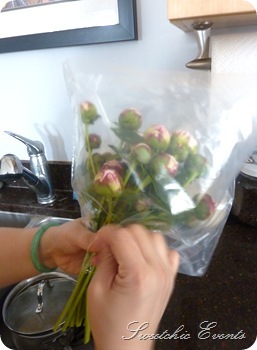 According to Kathleen, you can store unbloomed peonies in your refrigerator for up to 6 months!! I did a bit more digging online and found a few links (here, here and here) that talk about refrigerating peonies, but the general consensus is that they will last about one month and not six months (I also heard the same from a florist I spoke to recently). To see the full TV segment, click here for Peonies 101 on the Martha Stewart Show. FYI, it’s a 15 minute clip so it takes a little while to load. Fast forward to minute 6 for the refrigerator tip! 1. Cut (or buy) peonies when they were still tight buds and cut the stems so they were all even. I’m actually not sure if some of these buds are too “tight” to even open in the future. 2. Wrapped them in a cellophane “collar” to prevent frost in the fridge. I didn’t have a cellophane collar, so I cut a corner off a gallon-sized freezer bag as well as the ziplock strip and slipped them into the corner slot. 4. Placed them in my fridge… I hope this works! 5. Once you take the stems out of the fridge, re-cut the bottoms and place them in room temperature water and they should hopefully open in 8 – 12 hours. Here is a shot of some full blown peonies from my mom’s garden. Can I just say that peonies make me insanely happy! ?